Hello wine lovers and happy wine Wednesday! I hope your week has been fantastic and September has started well. 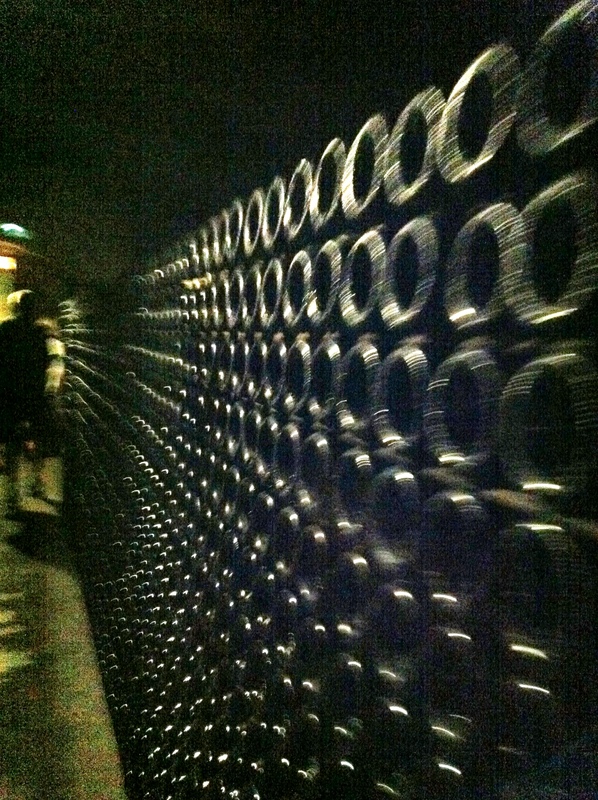 This week’s post is on my tour of the most popular champagne house in the world – Möet & Chandon. In business for over 270 years, Möet & Chandon is based in Epernay – a short train ride away from Reims – and is located on the famous Avenue de Champagne. It is an impressive house with iron fences surrounding the premise and a statue of the famous priest, Dom Pérignon, for camera-happy tourists. I went to check in for my tour and gave the lady behind the desk my card. She told me that I could not write about anything I saw on the tour. I raised my eyebrow at her. She said I had to be accompanied by someone from their Paris head office. I replied that I was here, now, and would like to go on the tour. She handed a complimentary ticket to me and I wondered what all of that was about as I sat and waited. Our tour guide was fantastic and clearly in love with her job. Her english was excellent and she did not stop smiling for the entire 45+ minutes of the tour. Yay! Off to a great start with someone keen on having her tour group enjoy themselves. She lead us through a hallway with windows on one side and a gallery of portraits of the Möet & Chandon family tree on the other. We were told that Napoleon visited the estate many times and gave them the “Imperial” title which is still their flagship brand. The Möet family built a ‘mini-Versailles’ for Napoleon that you can see across the road and out the window. And, legend has it that Napoleon and his troops invented ‘sabering’ (opening a champagne bottle with a sword) to celebrate victory. Très cool. It was short movie time and we were ushered into a nice room for a quick film on the history of the house, their international acclaim, vineyards and style. What was sorely missing for me was a soundtrack that should have been “Killer Queen” by Queen, “She keeps her Möet & Chandon in a pretty cabinet..” Oh well, maybe not every one is a Queen fan like me. Onward to the cellars, Möet & Chandon have 28km of cellars! That is a lot of ground with a lot of champagne! They own 1,200 hectacres of vineyards and they also purchase grapes from growers throughout the region. We were told that they press their grapes within 6 hours from picking them and they employ 3,000 grape pickers every year. Möet & Chandon have 10 wine makers and one cellar master ( oh what a dream job!) and their riddlers can turn 50,000 bottles a day. Amazing. Our tour guide enjoyed answering questions and doing the tour. Her enthusiasm was contagious and we all started bubbling up with energy and more questions as the tour progressed into the tasting room. 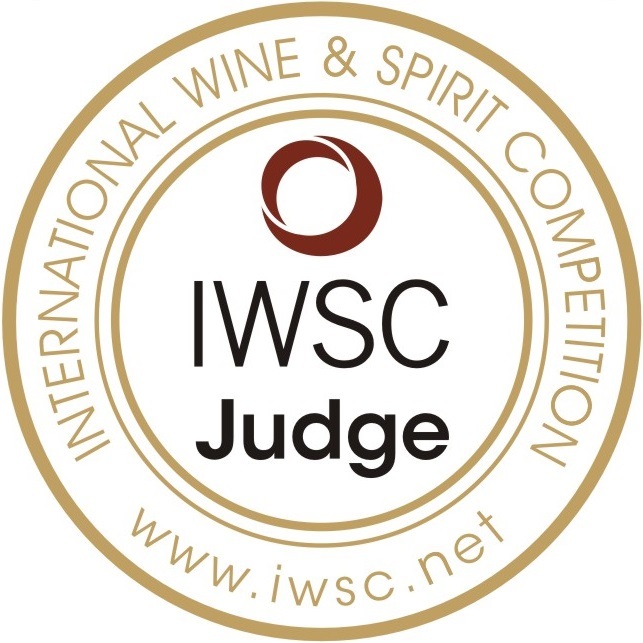 I was given a glass of the Imperial house brand and it was good – pale lemon in the glass with flavours of red berry along with some citrus notes and white flowers which were nicely balanced by sparkling, high acidity and a medium long fresh finish. Delish. I met a very nice couple from Australia in the tasting room who have promised to suggest some great Australian reds for me to try in the future (hint, hint, nudge, nudge). 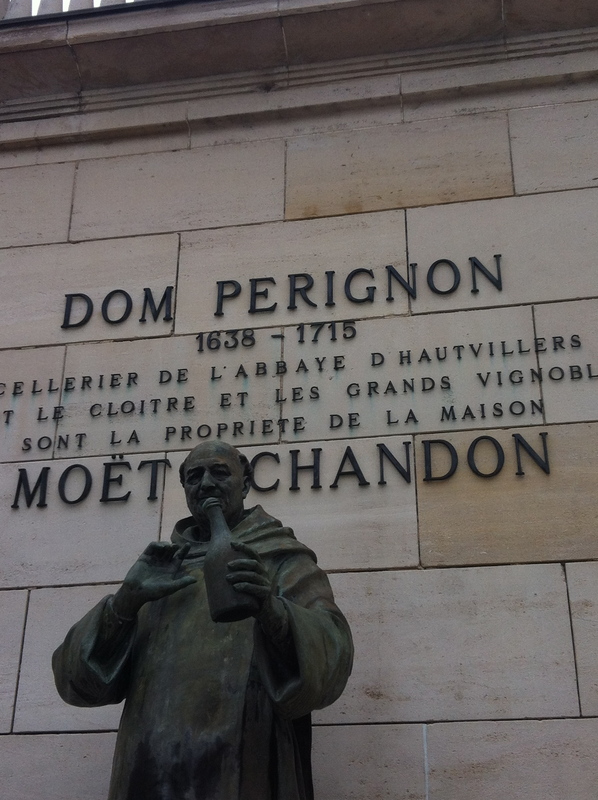 I left the Möet & Chandon house in Epernay pleased with the tour and my experience. I walked up and down the Avenue de Champagne almost pinching myself because I couldn’t quite believe I was there. Sigh…it was a fantastic trip and I am so thankful to my love, David, for encouraging me to go and enjoy. “I only drink champagne when I’m happy and when I’m sad. Ah Lily – I knew we had SO much in common – Cherie, you drink (you are not morte are you?? )with the same gusto/philosphy as do I. !!!! A votre Sante!! !